TaylorMade's lineup of M drivers and fairway woods have been wildly successful, as evidenced by the ever-expanding list of tour pros who carry them in their bags. Some of the world's best drivers of the golf ball will be playing the all new TaylorMade M3 Driver and for good reason. The new M3 features a sweet of ground breaking technology and revolutionary club design. The most notable break through is Twist Face. 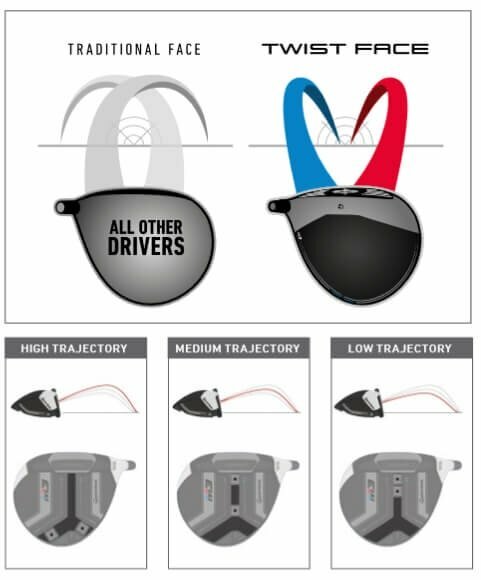 Twist Face is TaylorMade's new corrective face curvature, which helps mishits fly farther and straighter. Twist Face's toe is aimed farther right and lofted up in comparison the center of the face. Conversely, the heel aims farther left and has less loft than the center of the club face. Twist Face actively combats the low-left toe strike and the high-right heel strike. Also new to the M3/M4 is the Hammerhead slot. The outside of the slot is reinforced, allowing for a thinner, lighter, more flexible face. This results in a larger sweet spot. The center of the Hammerhead slot helps generate higher ball speed and lower spin. The M3 sets a new standard in adjustability with TaylorMade's aptly named Y track system. The Y track features two 11 gram weights that move without restriction and cannot set up for draw/fade/high/low ball flight personalization. Moving the weights to the back of the Y creates a forgiving draw or fade. Splitting the weights spells ultimate forgiveness. The new M3 is long, forgiving and fully customizable, but that's a claim every manufacturer makes. TaylorMade and only TaylorMade can say they make a driver that actively corrects mishits. Very forgiving club. Gained about 10 yards to my drives. FINALLY GOT THIS IN MY BAG! I tested this club last year in May and I knew I wanted it in my bag, but the price at the time was a little much for me. Fast forward a year, I was closing in on getting the Cobra F8+ plus driver and I wanted to test the M3 one more time. The M3 outperformed the F8+, in my opinion. Add to that it was one sale $248, there was no question it was coming home with me this time. Got a differrent grip, CP2 Pro grip, and I am all set. Thank You Carls for always, always having the best prices and the best Customer Service. Easy ordering, timely shipping and they even helped me track a customized driver from the manufacturer. I would recommend Carl's Golfland to anyone and everyone. Purchase will be made, very soon. I tested this driver versus the M1. What a difference the twist face makes. With the M1 my drives were averaging 230 to 235 and very inconsistent. Then with the M3, 245 to 250 average, all were center hits with a few misfits. The mishits were not as bad as the M1. I was very impressed with the M3. I cant wait to get it in my bag.